Mission Control in full flight. 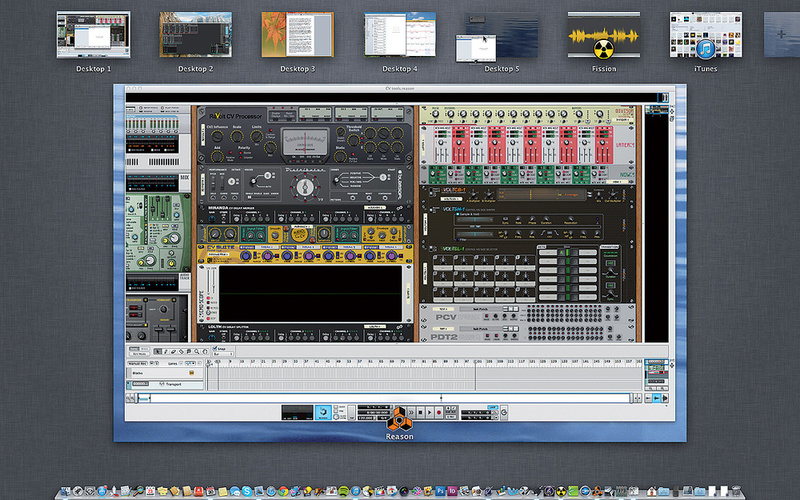 Here it's showing the five desktops and two full-screen apps I'm currently running. You can also see an app being dragged from Desktop 1 to Desktop 5. Last month, we began to look at some of the desktop management features in OS 10.7 and 10.8 that were previously called 'Exposé'. Lying at the heart of them is Mission Control, accessed with the F9 key or a three-finger upward swipe on a trackpad. It gives an overview of everything that's going on in your Mac and, as we'll see this month, is also the starting point for several very useful app and window organisation techniques. In its simplest form, Mission Control gives you a little thumbnail view of your Desktop at the top of the screen, and an overview of all open windows below. They'll either be all jumbled up or gathered together by application, according to whether or not you had the 'Group windows by application' option in System Preferences/Mission Control ticked. From this view, you can click on a window, and that's about it. If you had any applications running in full-screen mode when you pressed F9, you'll also see thumbnail versions of them, labelled with the application name. As you can click them too, this creates an alternative application switcher. But you can also try this: press Control and either the left or right arrow key (or try a three-finger horizontal swipe if you have a trackpad) to switch the focus between the thumbnails, and get a more detailed view of what each screen contains. To exit Mission Control, hit F9 again, or the Escape key, or do a three-finger downward swipe. One of the most exciting things about Mission Control is its multiple desktop feature; it replaces what used to be called Spaces in older versions of Mac OS. It allows you to increase your screen 'real estate' many times over, separating out applications and their windows across multiple desktops, keeping things tidy and minimising distractions. Here's how it works: press F9 to go into Mission Control and mouse up to the top right of the screen. A new desktop slides in from the right with a superimposed '+' sign. Click it to enable it, and watch it fly over into the thumbnail strip. Now you've got a whole lot of options. Assuming you're still in your first multi-window (and possibly quite messy) desktop, you can start moving things into its new empty neighbour. Drag and drop individual windows from the overview area into the new desktop's thumbnail. Or, if you have application grouping enabled, drag and drop an application icon to move all its windows in one go. To switch focus to another desktop, use the same Control-arrow shortcut or three-finger swipe from before. Should you want even more desktops (and why not? ), mouse up to top right and, again, accept OS X's offer of a new one. Even cooler, drag a window or application to the top right and drop it on a freshly emerged desktop to create it and move the windows in one go. Drag thumbnails left and right to re-order your virtual spaces, or click their 'x' close boxes to delete them. Any applications they host are moved to other desktops. Helpfully, you don't always have to go into Mission Control to switch desktops when you're working normally. Just hit the (now familiar) Control-arrow keystroke or do a three-finger swipe. And if you know the precise number of the desktop you want to go to, just type Control-[number] to get there. What happens when you're working in a multi-desktop environment and you launch a new application? Well, normally it just opens into the current desktop. If you like, though, you can make applications open into specific desktops. That's good if you prefer to run your DAW in Desktop 1, an audio editor in Desktop 2, and keep Mail and Safari shoved out of the way in Desktop 3 and 4, for example. To do this, you'll first need to manually move windows or applications to your desired desktops, as described above. Exit Mission Control. Now visit each desktop in turn, find the dock icon for the application (or applications) it's hosting, right-click it and choose Options/[Assign To] This Desktop. That 'binding' then stays valid for as long as the desktop exists.